Roland TD 30KV Review - The Electronic Drum Kit of Your Dreams? Roland TD 30KV Review – The Electronic Drum Kit of Your Dreams? I think you’ll agree with me that the Roland TD 30KV comes with a hefty price tag. That begs the question if there’s actual value to justify the costs. So I thought it were high time to put this electronic drum kit to the test. What dominates at the end of the day? The price tag or the value? You’re about to find out in this Roland TD 30KV review. I can tell you already that I think this kit is a masterpiece in terms of how closely it emulates a real acoustic kit. All while keeping the advantages of an electronic kit (sound range, ease of customization etc.). 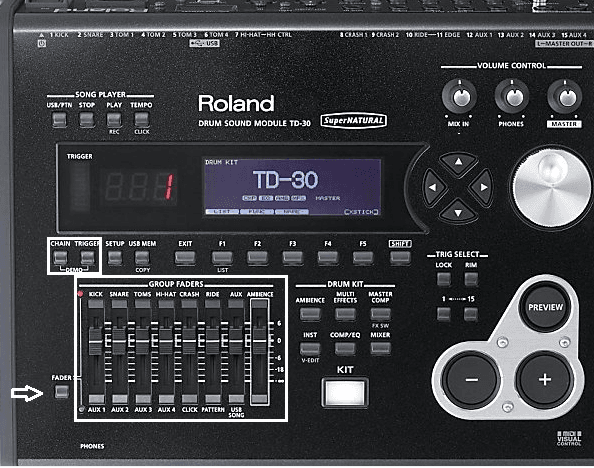 But you still need to decide if you need all the bells and whistles the Roland TD 30KV provides. And I’m confident this review will help you find out! The Roland TD 30KV is not sold (in most stores) any longer, and there are now quite a few more affordable options available on the market – for example this one by Alesis and this one by Roland themselves. 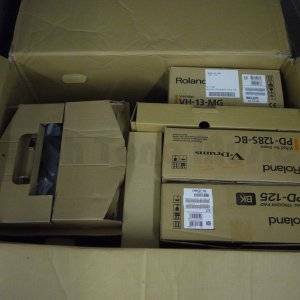 However, if you absolutely want to get your hands on a Roland TD 30KV still, you might find it over here. Customize and modify the settings to your heart's content! And with the Roland TD 30KV it’s not just the outer appearance that impresses. Rather, the craftsmanship and dedication that seem to have gone into any part of this kit are amazing. The TD 30KV’s trigger pads are designed to feel like real drums. Therefore, they aren’t made of rubber like with many beginner electronic drum kits. And the pads aren’t made of mylar, the material used in real drum heads either. This is because many drummers expect an electronic drum kit to be quieter than an acoustic one. So the pads of the TD 30KV are actually made of mesh, which is a woven texture that absorbs the sound your physical hit produces as well as possible (you should still expect a strike to produce 50 decibels of “noise”). At the same time, of course, the sound module translates your strike into any sound you’d like – at any volume you choose. The point being: these pads are quiet but produce great sound. Plus: they are softer than an actual drum head of an acoustic kit (made of mylar). You might well think that this is a disadvantage, but I actually think it’s a good thing. This article will tell you why in detail, but here let’s just say: the less rebound (from a softer surface) you practice with – the better / faster / more relaxed you’ll play on a surface that has lots of rebound (read: an acoustic kit). And since chances are high that you will play acoustic kits here and there even if you own the amazing Roland TD 30KV – your playing will benefit a lot. The point being: these pads aren’t only quiet and sound great – they also give you an edge when practicing. Unlike most entry-level electronic kits, the TD 30KV does not use sampling loops (the pre-recorded sound that play each time the trigger pad is hit). This kit uses “SuperNATURAL sounds with behavior modeling,” which means a new and unique sound is produced every time you hit a pad, just like with an acoustic kit. The Roland TD 30KV’s SuperNATURAL sound and behavior modeling operates without you needing to do anything about it. But of course, a kit of this price also brings with it a load of customization options. These are all controlled via the sound module. 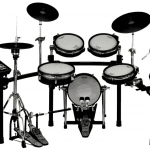 This electronic drum kit comes with its own sound module, and like most sound modules, the buttons are labeled according to their purpose, so no guesswork needed there. Below, for instance, you’ll see the 8 levers I’ve marked on the interface. These control the “fade” of each individual pad you hit while the LCD screen lets you view all other variables and parameters that you can adjust. The module interface seems very complex, but with some tinkering and helpful tutorial videos (like the one below), you’ll be able to customize your kit’s sound to your exact preference in no time. First, you can adjust various characteristics of the sound you’ve chosen your individual drum pad to trigger. Shell Depth: increasing the depth or length of the shell can be done on this module, increasing the size or length of your kick drum, for example, would cause the produced sound to be much deeper, and with heavy undertones. Beater Type: (as it relates to the kick drum) you can switch the type of beater you want the sound to emulate – plastic, wooden, etc. Sound Muffling: the module offers multiple sound muffling values and subvalues to get a precise tone. Resonance/Mic Position: you can change the position of the microphone just like on a real kit. These values adjust the way the sound resonates when it is played, increasing the resonance values would cause your strikes to sustain pitch for a longer duration. Hi damp Freq (Hz): High frequency damping simulates a warm sound through reducing the impact of the higher frequencies in a sound. Think of how your voice sounds in a room with lots of wood, pillows, blankets, etc. This would produce a similar “dampening” effect. Hi damp (%): The second value is the percentage to which the Hi damp effect relates to the overall sound of the kit. Mid or Middle dampening frequency (Hz): similar to high frequency dampening, but is applied to the mid frequencies, which make up most of the sounds audible to the human ear. Low cut frequency: The low cut determines the lowest frequency that your Roland TD 30KV will be giving out. I’m amazed by the quality and wide range of options this drum kit provides. I think you can’t ask for more than an electronic kit that gives you the freedom to play any style of music (and switch between different ones in an instant) while always producing top-notch sound quality and ensuring a realistic feel. So if your goal is to play the drums on stage or in the studio and be backed up by high-quality sounds and an organic feel to your playing, this kit is for you. The Roland TD 30KV is also for all drummers who want to unleash their creativity and harness all the opportunities of an electronic kit while being able to close their eyes and feel like sitting on an acoustic one. On the other hand, I can easily see how the variability of this kit could be too much for some drummers. In fact, I think that drum beginners would either waste money on this kit (because they wouldn’t use the customization options at all); or they would be overwhelmed by all the knobs, levers and sound nuances – so they’d become frustrated with the setup. That being said, the ins and outs of setting this kit up and getting the most out of the endless customization options can be learned via Youtube (see tutorial on the sound module above) or individuals documenting their experience in a forum. But again: most of my students (read: beginning drummers) just want to set that ol’ kit up and play. So please decide what you prefer! Does it come with a kick drum pedal? Throne? Sticks? This kit seems very complex, how can I learn more quickly? First: the Youtube tutorial I’ve provided above and the forum entry I’ve linke to just a few lines above this. Second: trial and error. If you want an individually sounding kit (which is what the Roland TD 30KV is perfect for) you need to figure out your individual settings. As I said, some people love doing that; some don’t. That’s what the choice for or against this kit comes down to. Will I be getting a warranty, is there an option for one? No, this kit doesn not come with a warranty. Okay, so you’ve outgrown your rubber-padded electronic drum kit, and now you want to upgrade to something that still gives you high-quality sound AND and you really want those incredible mesh toms AND you have a considerable budget – BUT you don’t want to fiddle with the complex settings of the 30KV. Well then the Roland TD 25KV might be right up your alley. The Roland TD 25KV has that natural sound feel in a more affordable package. It does not offer the same level of customization that the TD 30KV has, but it also has that organic sound and feel. It certainly isn’t cheap either but a whole lot cheaper than the Roland TD 30KV. The parts that make up the TD 30KV are of great design quality and structure. That brilliant sound module can give you an almost infinite amount of sound variations to truly create the sound you desire. The SuperNATURAL sound and constant behavior modeling really gives you the nuances of an actual drum kit so you’ll have that “real feel” during practice, in the studio and on stage. In short, Roland designed this kit for drummers who want the best of both worlds. It’s an electronic system which offers a realistic experience, and this is something that I think most drummers want. 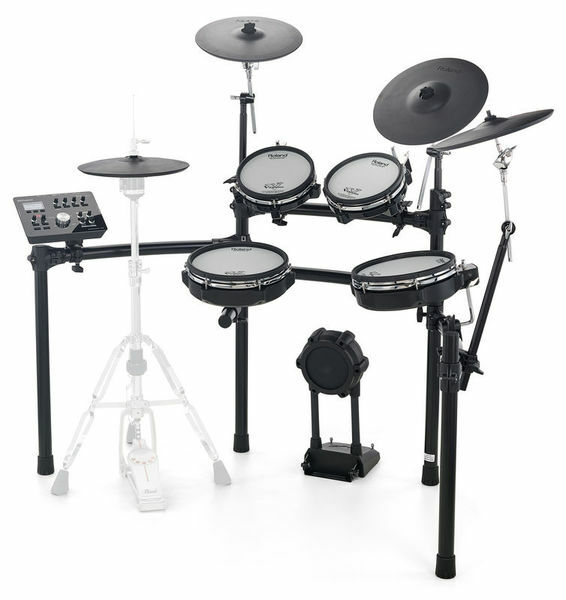 There are very few electronic drum kits on the market that give you the versatility and level of customization that the Roland TD 30KV offers. With this kit, I honestly think you can’t get any more acoustic while playing electronic! In any of those cases: let me hear from you. I’m more than happy to talk to you – and will answer EVERY comment!